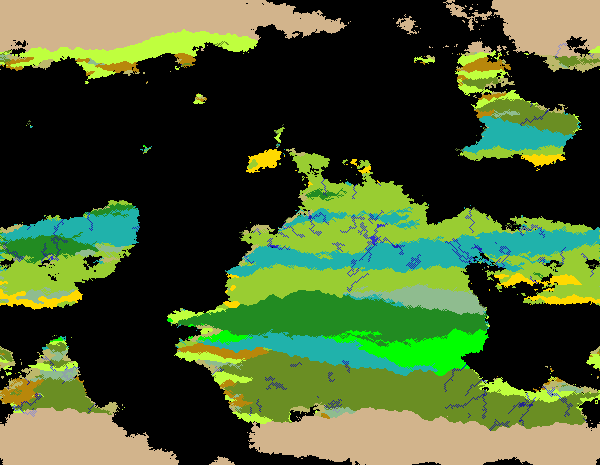 A few comments regarding the river generator: You are placing a lot of emphasis on the spring. This does of course make sense but aren’t you underestimating the importance of drainage basins and drainage divides? Most of the water flowing in a river doesn’t originate from the spring but is surface overflow of the area the river runs through. 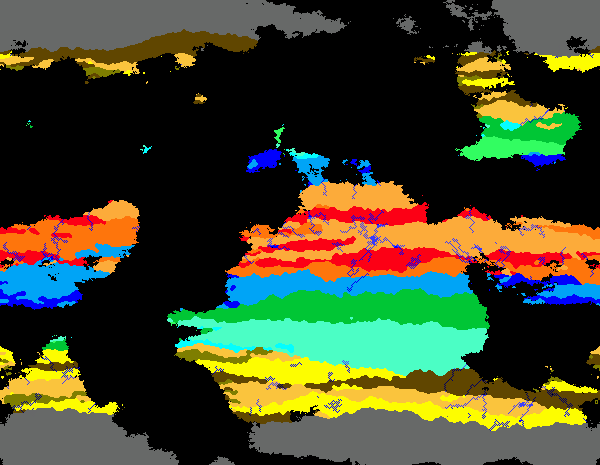 To correctly predict a river’s size and flow you would need to simulate drainage divides for your world to make sure you have consistent drainage basins. You are correct, of course. My approach is to build these things up iteratively, and in a modular fashion. I want the river generation to be “good enough” at the start, and then go back to it later. One step I’d like to add to the generator at some point is to simulate erosion and actually have it carve drainage paths through the landscape. Another approach would be to take every region I’ve identified as rainy (based on the climate) and simulate the effects of rainfall on it. As before, water would run from high ground to low ground, taking the quickest path possible, and in instances where there’s more than one path (that is, multiple adjacent pixels are tied for lowest), the river would fork and continue its downhill path in multiple directions. 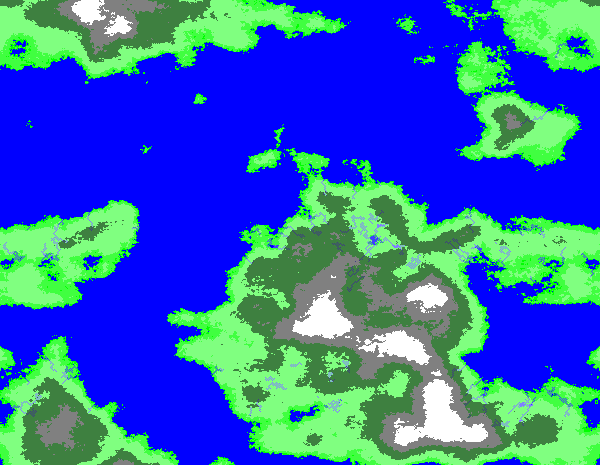 I actually had that in the code originally, but it created a huge mess and covered most of the map with rivers, so clearly I need to constrain it somehow. One thought I had was to allow the length to be variable based on the river generation. Generation 1 would be where the river began at its highest point, then when it forks, those would become subsequent generations. Since a fork means the river now has half as much water flowing along each of two paths (simplifying here), its maximum possible length should also be halved, and so on until we’ve “run out” of water to flow or hit an ocean, whichever comes first.